Prime Minister of Lithuania offers to initiate dialogue between European Union and Israel in pursuit of 'compromise on int'l issues'. Lithuania's prime minister on Friday proposed talks between the European Union and Israeli leaders focused on terrorism amid tensions over Iran and the Arab-Israeli conflict. "Lithuania will initiate discussion in EU home affairs council with Israeli public security minister over terrorism threats and other security issues," Prime Minister Saulius Skvernelis told AFP in an interview. 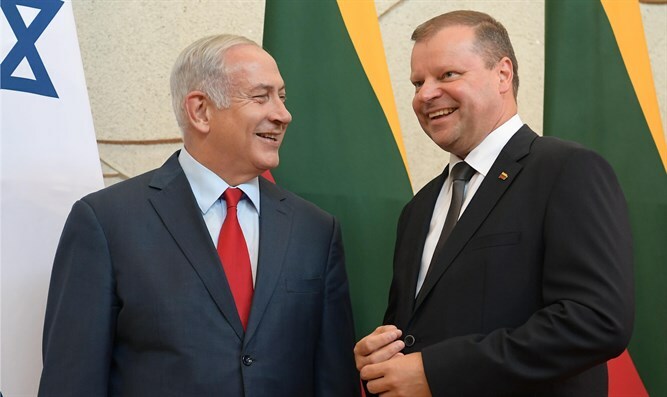 Skvernelis said he discussed the idea with Israeli counterpart Binyamin Netanyahu who is in Vilnius for a four-day visit to boost bilateral ties and build support for Israel's interests in Middle East. Lithuania, one of Israel's stronger allies in the European Union, was behind Netanyahu's invitation to meet with EU foreign ministers in Brussels last December, irking some Brussels officials. Skvernelis says his country backs the EU position on a two-state solution to the Arab-Israeli conflict, the status of Jerusalem and the Iran nuclear deal, but wants more direct dialogue between the EU and the Jewish state. "We want the discussion to happen as it would help to seek compromise on complicated international issues," Skvernelis said. Officials said no date was set yet and the format would depend on reaction from Brussels and Western European capitals which are more critical towards Israel over its policies in Judea and Samaria. The prime ministers of Latvia and Estonia will join Lithuanian and Israeli counterparts later on Friday for talks where Netanyahu is expected to seek more pressure on Iran.